The bright, airy Market Kitchen brings to mind a European arcade rather than the dense, disorderly bazaars associated with much of Asia, whisking patrons on a culinary journey through several continents via a series of live cooking stations and lavish buffet spreads. The adjoining Market Larder, a warm nook stocked with fine wines and takeaway hampers of carefully sourced delicacies, is also a reasonable approximation of the specialist grocers found in many Western capitals, where every shelf may yield up an undiscovered treasure. But lest we forget where we are, Market Kitchen is Korean right down to its (literal) bones. A key feature of the design, overseen by New York-based AvroKO, are the ruins of an old house that were unearthed in the hotel’s excavation, which have been encased in glass and incorporated into to the flooring. The subterranean theme continues with the use of massive, veined onyx slabs throughout the venue, some embedded with pieces of antique furniture. 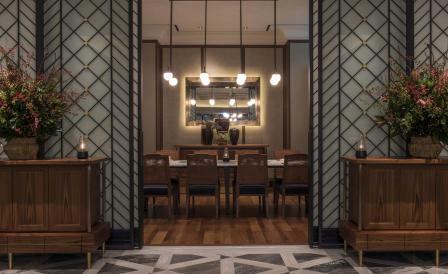 Custom lighting inspired by vintage mining lanterns and displays of traditional earthenware and basketry add to the sense of a place that straddles time periods as well as culinary traditions.